based on the values and expectations of other people and society? In today’s world, there is much pressure to conform and achieve according to the standards of other people and society. Success is seen as being “driven”, “motivated”, “famous”, “looking good”, “getting ahead” and accumulating status, popularity or material possessions. Let us ask ourselves these questions,… Are we being true to our heart? Are we sharing the true essence of who we are? Despite our self-doubts and vulnerabilities, do we find the courage to keep moving forward and into the unknown? Is the life we live a reflection of our own gifts, talents, and creative expression? Are we sincerely devoted to our path of healing and growing? Are we in alignment with a greater, higher power rather than our ego’s shallow needs, wants and desires? Mainstream society does not encourage self-reflection and completely neglects the inner journey of discovering who we are, embodying our unique, creative potential and a sense of purpose for our life. When we begin the work of healing and balancing our sacred masculine and feminine energies, our life and journey takes us on a very different path and experience. First and foremost, we know we cannot be truly happy and fulfilled, unless what we do and how we live is an expression of our heart and soul being. This is not an easy path to commit ourselves to. However, the outcome is that we honour our soul journey and potential, rather than put on a superficial mask to be accepted and “liked”. Over time, as we focus on becoming more honest with ourselves and our inner work of healing and growing, our sense of integrity, authenticity and discernment grows stronger. 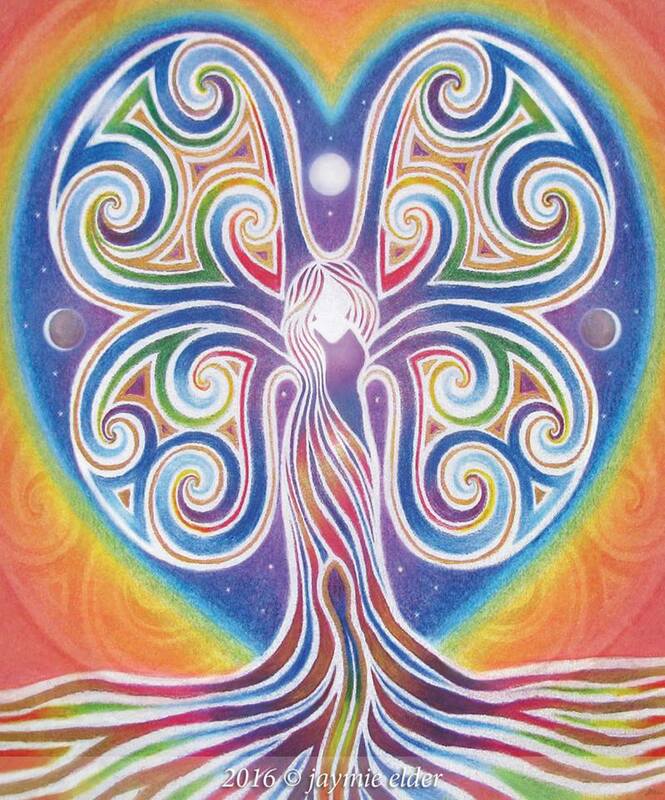 As we open ourselves more to the Sacred Feminine within us and all around us, we become conscious of our own being, which is unique to each one of us. The more we are in balance with our own being, the more we are in balance with all of creation. When we truly embrace our soul journey and purpose, we cannot be bought, manipulated or pulled into a superficial, fear-based world of the ego/mind. Instead, we are moving towards a world of the heart, which is based on feelings, compassion, connectivity, gentleness, innocence, sharing, love and a mutual respect for all people, all living beings and Mother Earth. The journey looks easy, and is attractive when presented in nice sounding words and beautiful pictures 🙂 …. however, our inner work of healing and growing takes a lot of patience, humility, resilience, courage and devotion to keep being open for more truth, healing and transformation within ourselves and in our own life. The truth is that to some degree, we have all been wounded by our parents and society. In our cellular memory we carry inter-generational wounds passed on from our ancestors as well as experiences (both positive and negative) gathered in this and past lives. Many of us may prefer to deny, forget, block out or purely focus on the positive aspects of life and Self but this will only delay our many opportunities to continue to heal and grow deeper on our soul journey. Most of us have been pressured to “fit in”, and as a consequence, we have disconnected from our heart and our true self. When we neglect our inner life, (our feelings, our wounds, our shadow, our inner child), we become unbalanced. As a result, we can be easily influenced, manipulated, pressured and distracted by mainstream society, which pushes us to “achieve” based on what we see or judge “outside” of ourselves. Seeking to fulfil the superficial desires of our ego self will never satisfy the needs and ancient longing of our soul. We must recognise and reject our societies de-valuing of our soul’s worth. We do this by taking the time to explore our inner life, connecting with our true purpose and the longing of our soul to express, create, share and be true to our heart. We can not do our healing work alone. It is important to find the safety and support of people (who are on a similar journey) to be authentic, share, reflect and express how we are truly feeling, in our heart and life. My healing journey began when the internet, social media and the new age spiritual movement was not as advanced as it is today. There was no Facebook, Twitter, YouTube or Instagram to share insights, spiritual knowledge, consciousness and support for each other. From the outside, it may have seemed like a “lonely” journey to embark on – already in my early twenties. I remember feeling a disconnect (in values and consciousness) from the young people of my generation. During this time, I was drawn to develop relationships with people in their 50’s and 60’s and my grandmother became my close friend and mentor. While I spent much time alone, I never truly felt “lonely” because I always shared a very close relationship with nature. During that period of my journey I cried so much. For the first time in my life, I felt safe to allow myself to truly feel my emotions. Within this, I found empowerment in being able to express my vulnerability – sharing with safe and supportive people. I intuitively knew my feelings of sadness and the longing of my heart went deep into my soul and ancestral memory. I was willing to see my healing and self discovery as the most valuable journey I could embark on in life. On reflection, I know this was the most important and empowering stage of my journey – the dark night of my soul. I stopped trying to do what others and society expected of me and started to honour my feminine side – my longing to heal, nurture, create and be true to my heart without any time constraints or expectations coming from outside myself. I am thankful for the healers, mentors, wise women and councillors that came into my life to support my healing and growth. But most of all, I’m grateful for the “unseen support” of my own spirit guidance and ancestors. They never failed to offer their strength, inspiration and unconditional love during the moments when fear overruled my sense of inner safety and trust. Today, there are many potential benefits of creating online community to raise consciousness and connect with other like minds around the world. Further than encouraging and inspiring each other, we may never know how far a message of truth and love can travel to reach the heart and consciousness of others. However, today it is also easy to be distracted, pressured and overwhelmed by so much information via the internet. More than ever, we seem to be “living in our heads” as opposed to being present and connected with our bodies, feelings and our heart. On YouTube and Facebook there are numerous self proclaimed healers, spiritual teachers, life coaches and therapists “driven” to promote themselves, attract popularity, and sell their self-help or spiritual entertainment techniques for a “successful, happy life”. People who are new to healing work and genuinely need support and guidance, can easily fall for the projected mask people portray of themselves and the promise of short term, superficial results. “There is no coming to consciousness without pain. in order to avoid facing their own souls. There can be no light without darkness. If you are a light worker, you are also a shadow worker! Awakening is an ongoing, transformative, unglamorous and often very difficult process of working with the core truth in ourselves, our life and the world. It is bringing awareness (light) to our wounded (shadow) parts of self. If we remain open, humble and heart centred – the awakening process will help us to relinquish our masks (protection) and journey deeper into our core wounds. Within our core wounds (our shadow) lies the potential for transformation and healing. By transforming our shadow with love and compassion, we discover a deeper sense of authenticity of who we are and the true purpose of our journey. We will move through our hurt and grow in love and compassion, not only for ourselves, but also for the people who have facilitated difficult experiences and challenges in our life. We may recognise and feel a deeper connection with our Higher Self, Spirit or Creator. There are no short cuts or quick fixes. If we believe we can whitewash our shadow through “being in the now”, focusing solely on “the positive” or pretending our wounds do not exist – we are fooling ourselves. Eventually, our soul will cry out to us and show us that we can no longer hide from the truth of our heart, body and life. As healers, therapists and light/shadow workers, we must recognise the importance and value of our ongoing sincere, inner work. The more we are doing our inner work, the more our energy vibrates and expands to attract and inspire others. We offer a supportive, energetic space of love and compassion for others to feel safe, come into their heart and follow the unique calling of their own soul and authentic journey. We do this not because we “need” too, based on our own lack of self worth, trust and need for acceptance from outside ourselves… but because we value our own soul journey and choose to shine our light, despite our self doubts and fears (often connected to lifetimes of persecution and torture we experienced as medicine men and women, herbalists, wise women, healers, teachers of the sacred feminine etc.). Moreover, sharing our wisdom, intuitive gifts, knowledge and experience is a spontaneous over-flow of the energy and time we have invested in our own personal healing and soul growth over many years (and for some of us, many lifetimes!). This is a time on the earth where we are all being challenged,… to reach deep inside our soul’s unique identity and creative potential – be, live and walk in our truth for the collective healing, transformation and rising consciousness of our planet. We are all here to grow through our own unique personal lessons and life challenges. Living an authentic life from the heart and soul means to continually choose transformation, healing and growth over self-limiting beliefs, stagnation and what is “known” to us. On my own journey, I have realised that the most important is how much I have grown to be and share more who I truly am. Today, I see the bigger picture of my life. I recognise and appreciate my past hurtful experiences as an opportunity to learn, heal, grow and become more loving towards myself and conscious in my relationships. Devoted to my continuous inner work, I am not the same person I was, 10, 5, 1 year,…or even 1 week ago 🙂 Having said this, I know I can heal and grow a lot more. I am very much committed to do whatever it takes to overcome my own resistances and reach deeper levels of unconscious wounds – waiting to be transformed through love, compassion and wisdom. I am grateful to be in a conscious relationship with someone who supports, encourages and challenges me to continue to heal and grow. Juerg is someone who is not afraid to be honest (with himself and others). He is also very loving and compassionate. Juerg sees my soul potential and my unhealed human wounds. He helps me to continue to grow towards my heart and soul being. At the same time, Juerg does not pretend to be perfect and is open to continue to heal and grow himself. I know that our journey of healing and growing together continues to help us to become more who we are and long to be in this lifetime. that in order to heal and grow unpleasantemotions must get triggered. at the trigger, i.e. your partner. Unconditional love means that you love each other despite your imperfections. Many people (especially we women) want our partners to “just love us the way we are”. However, this does not help us to move through our blockages and heal and grow on our soul journey. Our soul acts like a magnet to attract the perfect relationships and circumstances for healing and transformation to occur. As we work to transform our shadow with love, forgiveness and soul understanding, we open ourselves towards a deeper capacity to feel and share love. When both partner’s acknowledge their own shadow and understand that in relationships we can touch (trigger) each other’s wounds, the relationship offers a powerful tool for healing, growth and transformation. Our soul journey of healing and transformation, is unique to each one of us. As we continue on this journey, we can increasingly recognise the value of our inner work. This work does not require the approval or recognition of others. There is so much more to our world, which we may never see, know or truly understand. Based on my own experiences, I have come to see that it is not about “understanding” or “knowing” with the mind – it is about feeling and being present with our own loving, innocent and trusting heart. The more we come into our heart centre the more our intuition, learning and wisdom from our own journey can flow freely. The more we heal and grow, the more real and authentic we become and the less we are concerned with seeking approval or validation from outside ourselves. We touch and attract others with our energy. Relationships are a wonderful opportunity to continue to heal and grow. Embracing our soul journey has the potential to bear so many beautiful fruits, not only for ourselves but for all our relationships, our ancestors, children and grandchildren. Our soul journey will always offer us opportunities to grow and embody a deeper sense of feeling, understanding, wisdom, compassion and love… There is always more to come…. May this article plant a seed. May it help you to recognise the value, challenges and opportunities of your own soul journey. “The most essential in your life is your own being. your heart will always remain empty and dissatisfied. through a maze of meaningless limitations. no spiritual entertainment technique can help you. but that’s in fact your liberation. If you enjoyed this post, please follow my blog or register to receive notifications in your email box for my future posts. If you wish to take some of my text and share it on social media, please do so respectfully by acknowledging myself and my blog: http://www.rainbowtreewoman.com. Thank you! Special thanks to Juerg for helping me edit this text. Very reflective, I have read through and am saving to re read over and over when I come upon some of the stumbling blocks of life which I know will appear from time to time. Only time itself knows the destination. Thanks so much. So glad to hear that Sean. Thank you for taking the time to share your perspective. I’ve recently returned to this posting I made 2 years ago and realised I could go deeper and share more from the experience of my own journey. Yes, time allows us the opportunity to reflect and go deeper, definitely! Thanks again Sean.